Family life is jam packed with activities, school, sports and fun! 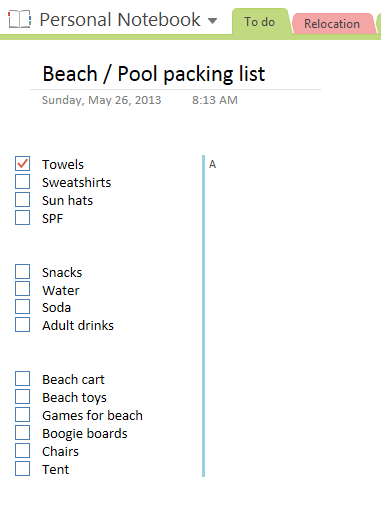 Sometimes it can be hard to stay organized between all of the schedules. As Cal and Ava get older, I find myself trying new strategies for keeping our family organized and in a digital home like ours, Office 365 Home Premium looks to be the answer. Office 365 Home Premium keeps everyone organized in a tech savvy way while making it easy for everyone to do it from wherever they are. 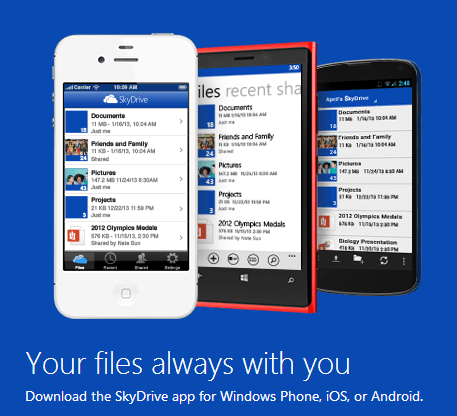 Microsoft SkyDrive allows us to organize every component of our life through their free cloud storage solution, SkyDrive. We each have our own laptops and we love that wee can keep files and images safely stored in the SkyDrive. Convenience is key in life and to access these files from any computer or Windows Phone device is truly helpful allowing us to stay organized and productive from wherever we are. 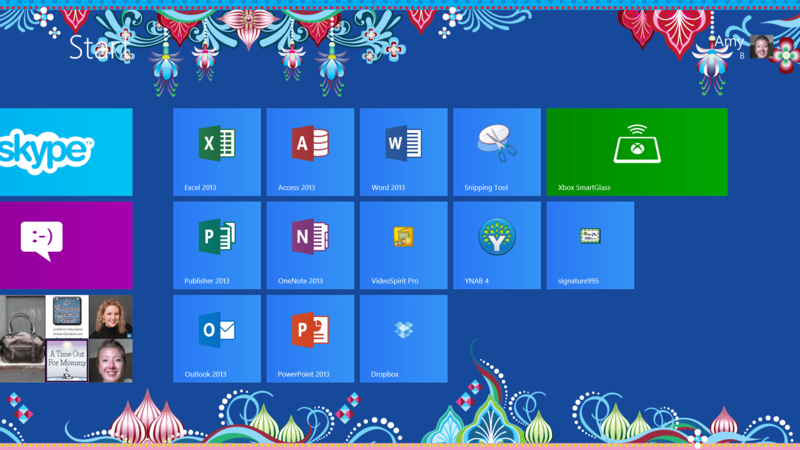 Excel 2013 is loaded with amazing features and some pretty fabulous templates. 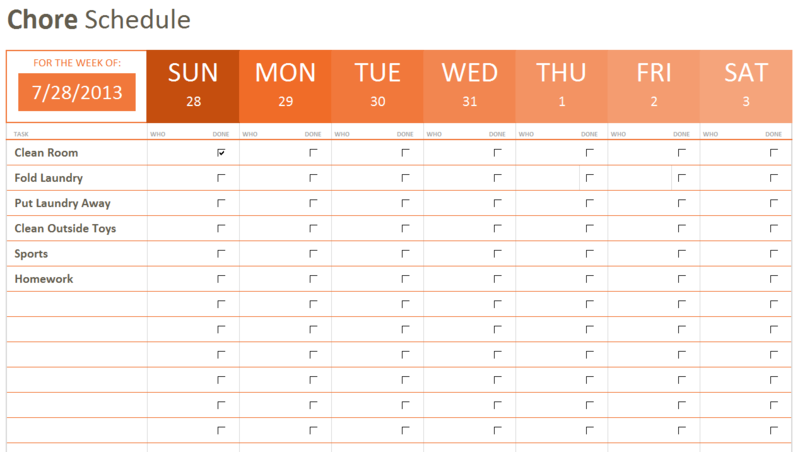 One of my favorites is the chore schedule template and guess what? I can plug in the date and it auto fills the dates appropriately. We assign names to them and get the satisfaction of checking them off when we complete them. For the kids, this template works really well because it is simple and clean in layout and it allows them to manage it themselves. They love this independence at their ages and I love that I don’t need to help them. We have tried apps to manage chores in the past but we always stopped because they were based more on the sounds and fun treats in the app versus a good old list like they will encounter in the real world. Mom and Dad can also stay organized from wherever you are. Whether you work from home, the office, or stay at home with your children, Microsoft has what you need. 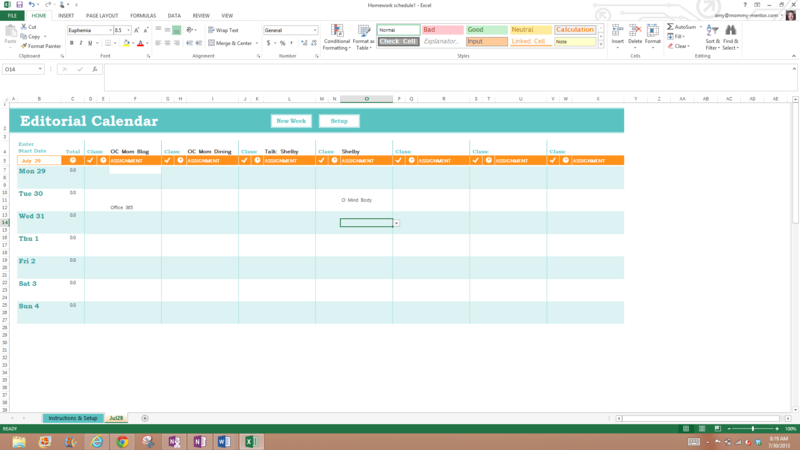 Another favorite I am in LOVE with is the schedule template in Excel 2013. I use it for our editorial calendar for the websites and have another version set up for Cal to manage his homework in fall. Office 365 Home Premium costs $99.99 for an annual subscription which runs about $8 per month. It can be purchased online at Office.com or in your nearest Microsoft Retail Store. We love how it helps our family stay organized and we hope it helps you, too!